The creation of a throughly modern kitchen integrated with garden area. 1. 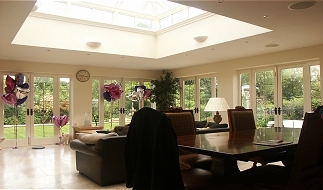 Open plan kitchen - Bramhall. 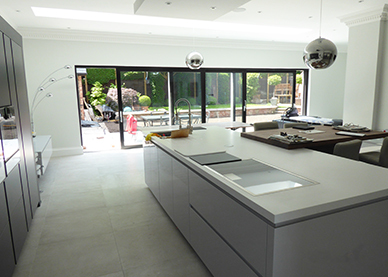 The project brief was to create an open plan kitchen integrated with an existing garden, providing maximum sunlight to bring the kitchen 'in to the garden'. We fulfilled the brief by fitting Schucco patio doors approx 8.5 m wide, along with flat roof sky lights to provide extra natural daylight into the kitchen. 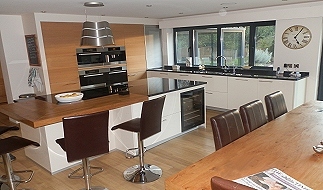 The kitchen was designed by Ultimo who are one of our trading partners in Wilmslow. 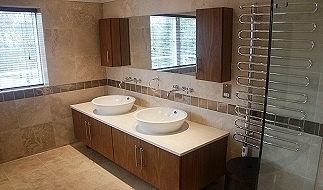 Exelby Developments provided the working drawings for the electrics and lighting incorporating Lutron Graphic Eye controls. We carried out tiling to the kitchen and continued the theme to the patio area so that the outside matched the inside, along with computerised lighting to the patio and cedar fencing to give a Mediterranean feel and look to the new kitchen.